Last fall, NYU Stern School of Business announced the establishment of the first Creative Destruction Lab in the United States—CDL-NYC—to support the commercialization of early-stage science and deep technology startups. CDL-NYC received a landslide of applications for its inaugural 2018-19 cohort from founders associated with some of the top research institutes and academic institutions worldwide. CDL-NYC accepted 27 ventures with an admission rate of less than nine percent, becoming the most selective program in the CDL network. CDL-NYC’s founders aim to commercialize disruptive inventions in a variety of fields such as artificial intelligence, robotics, material science, therapeutics and medical devices. The nine-month CDL-NYC program links experienced entrepreneurs and investors with venture founders to help scale their ventures through a structured, objective based mentoring process. The program also leverages NYU’s position as a world-class research university in business, technology, medicine, science, analytics and engineering to provide venture founders support on key technical milestones from NYU’s scientists, faculty, and economists. 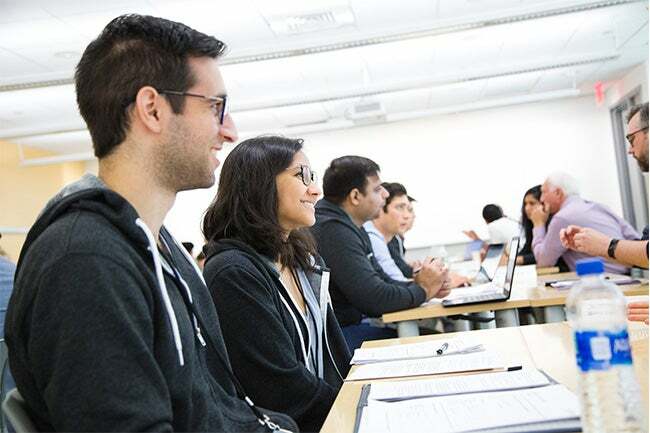 An affiliated CDL-NYC MBA course gives select students direct access to the venture development process as the students work directly with the venture founders. Finally, CDL-NYC’s corporate partners provide pro bono services, such as legal and accounting advice, to the startups. The CDL-NYC program is based upon the successful Creative Destruction Lab model founded at the University of Toronto. Creative Destruction Lab-New York City (CDL-NYC) is a nine-month program at NYU Stern for early-stage science and technology based startups. Through the program, startup founders are coached by program mentors, investors and scientists to meet individualized business objectives on eight-week intervals. Individualized objectives for each startup are designed to maximize each startup’s chance of scaling into a massive disruptive company. The mentors are headlined by the “G7-Fellows” who are experienced entrepreneurs, having had successful exits, and who are looking to invest in CDL-NYC ventures. Startups that fail to execute on their objectives can be cut from the program at the discretion of the mentors so that resources can be concentrated around ventures that are excelling. Those that meet their objectives are likely to attract investment from the G7-Fellows, as well as from one of the many venture capital firms that are represented in the program. While companies in the CDL-NYC program do not require an NYU affiliation to participate, all companies will benefit from access to and support from NYU scientists, economists, and MBA students. Startups can also benefit from access to several complementary services from CDL-NYC’s corporate partners. As CDL-NYC is an academic initiative of New York University’s Stern School of Business, CDL-NYC does not take equity or collect fees from startups. Its operations are supported by its Founding Partners and Corporate Partners. For more information, visit the CDL-New York City website.